Whoopi Goldberg was born Caryn Johnson, but let’s face it: she looks more like a Delores. That makes Goldberg the perfect choice for the female lead in the ABC comedy pilot Delores & Jermaine, in which Goldberg will play a no-nonsense ex-cop who takes in her shiftless, millennial grandson, played by comedian Jermaine Fowler. According to The Hollywood Reporter, Fowler’s character will help Delores, a football-obsessed shut-in, to be more active in the world, while her character will presumably do the same for Jermaine. The pilot will be written by Fowler along with The Office alum Daniel Chun. Delores & Jermaine will mark a return to scripted television for Goldberg, a move she has reportedly been considering for some time. 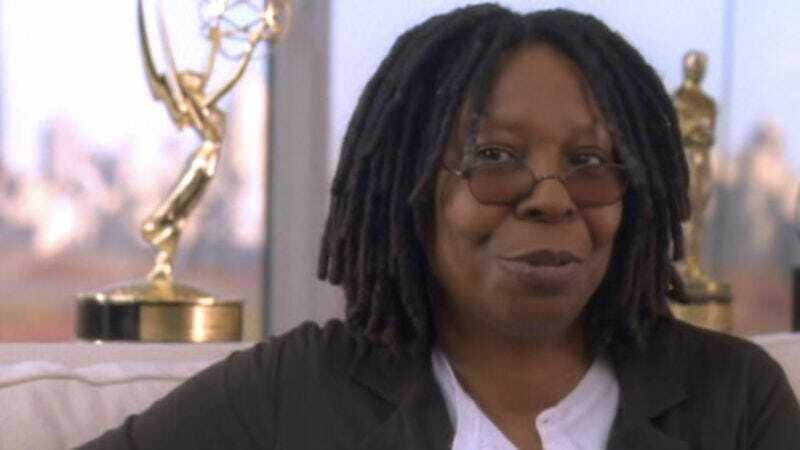 (Her last sitcom vehicle was NBC’s 2003 show Whoopi, in which she played a lounge singer past her prime.) Goldberg also has prior experience playing a Deloris, having starred as Deloris Van Cartier in the Sister Act films. The new pilot will not affect Goldberg’s role on The View, which is reconstituting its panel of hosts yet again due to Rosie O’Donnell’s planned exit. Should Delores get a series order, Goldberg will split her time between the shows, which should soothe View fans who dread the inevitable day when its panel consists solely of broken appliances.